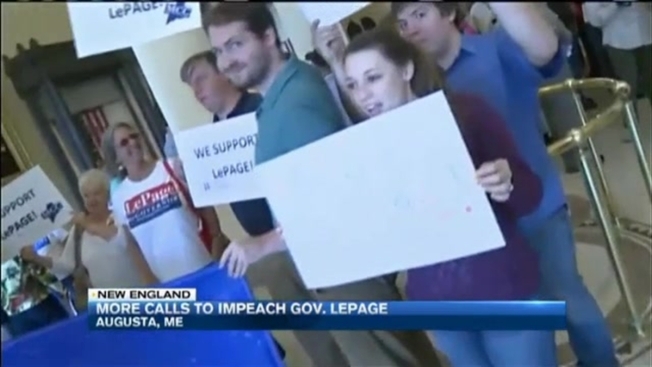 The calls for Maine Governor Paul LePage to be impeached are growing. More than 100 people rallied outside of the State House in Augusta, Maine Tuesday, following allegations that the Republican Governor blackmailed a Maine school to have a political opponent fired. Last week, Democrat Speaker of the House Mark Eves announced he lost his job as President at Good Will-Hinckley School. He said Governor LePage threatened to withdraw state funding from the school if it did not fire Eves. LePage admits making the threat, but said he was looking out for the school's best interest. Several legislators have requested the government oversight committee launch an ethics investigation into LePage. "If true, the allegations against our Governor are a direct threat to our democratic principals," said Cushing Samp, organizer of the anti-LePage rally. More than 10,000 people have signed an online petition, calling for the impeachment of Governor LePage. The government oversight committee plans to meet on Wednesday to begin looking into the LePage blackmail allegations. Rep. Ben Chipman (I-Portland) is one of the legislators calling for the investigation. He said if the committee finds wrongdoing, members of the House are prepared to proceed with the impeachment process. In a separate rally, Governor LePage thanked his supporters, but did not directly acknowledge the ethics investigation. Instead, he referenced a broom he was carrying and said he was elected to clean up state government. "I was elected by the people of Maine," said LePage. "You are the people of Maine and I will continue to work for you with every ounce of blood and breath in my body."